Since 1952, the Granbury Chamber of Commerce has been dedicated to strengthening and promoting the economic success of our community through effective leadership. The fourth largest chamber in the Fort Worth-Dallas metroplex and 900 members strong, the Chamber has forged strong partnerships with the City of Granbury and nearby Hood County communities, as well as with local economic development and tourism entities. Chamber committees and task forces actively improve the economic welfare of the community through study, recommendations and actions related to transportation, business retention and expansion, education, government affairs and the environment. Chamber staff and volunteers produce Granbury’s nationally celebrated Old-Fashioned 4th of July. The Granbury Chamber’s strength lies in its membership support. 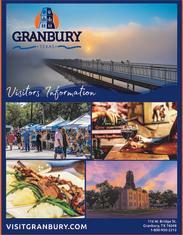 We invite you to join the Granbury Chamber as a business or individual.